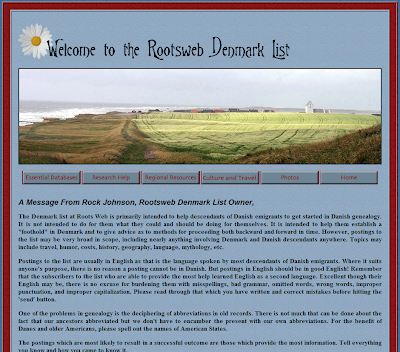 Rock Johnson, the administrator for the RootsWeb Danish Email list, has developed a Danish research site located on RootsWeb. This website provides the essential information on the history of Denmark and also the how-to of Danish Research. He is currently developing this site including Essential Databases, Research Help, Regional Resources, Travel and Culture, and Pictures. The author of the site reminds us that we need to spell out the full locality name not using abbreviations such as postal codes (CA for California), and use the best language we can when posting to Rootsweb email lists and message boards. I suggest that it would be best not to use abbreviations at all in our genealogical files as they can be the source of confusion later on when you are not on the earth to defend your research. If you are searching Danish roots, Danish Roostweb would be a great place to check out to assist you in your quest. Have fun!